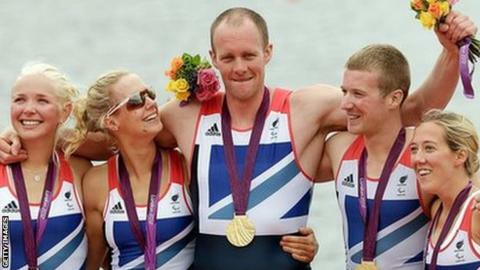 Paralympic gold medallist David Smith will aim for a Rio 2016 spot despite the return of a tumour on his back. Briton Smith, 37, wants to delay surgery, but if the tumour grows another eight millimetres it will cut off his spinal cord. Smith said: "I am living life with an eight millimetre of hope." Smith won gold as a rower at London 2012 in the mixed coxed fours but is aiming to go to Brazil as part of the cycling team. The Scot has already recovered from three rounds of surgery, including two in 2010. "This has been an easy decision for me to make as I could not face more surgery right now," he said. "I have decided not to have surgery right now and live my life for the next 11 months chasing my dream of cycling in Rio. The hope that it won't grow fast and allow me to train and enjoy my life for one more year before I go back into surgery. "I am hoping to travel to a clinic in Europe after the next surgery to try a new method of killing the cell in the hope I might one day live without this."